From Dr. Louis Diamond’s groundbreaking investigation of erythroblastosis in the early ’40s to Dr. Peter Hotez’s more recent work on tropical disease vaccinations, funding from the Hood Foundation has established careers and led to breakthrough medical developments throughout the more than 70 years of the organization’s existence. Fueling ambition in a way that launches careers and positively impacts the health and quality of life for children is what the Foundation has strived to do since the very beginning, inevitably facilitating the growth of a prestigious community of medical innovators that share the title of Charles H. Hood Foundation Grant Awardee. The impact of the Foundation on children’s health and medical research careers is far reaching. The Foundation is proud to have propelled the careers of promising junior faculty whose research findings have contributed to significant improvements in child healthcare since the 1940s. From then and continuing through today, the hundreds of researchers funded by the Child Health Research Awards Program have made seminal contributions that have helped transform the lives of countless children in the New England area and beyond. What’s more, the Charles H. Hood Foundation has shown that supporting promising investigators at the beginning of their careers is tremendously helpful in securing long-term funding from private and government sources in the future. This kind of leverage in funding helps build the talent pool of innovative medical researchers that will continue to impact the health and well-being of children and their families for decades to come. 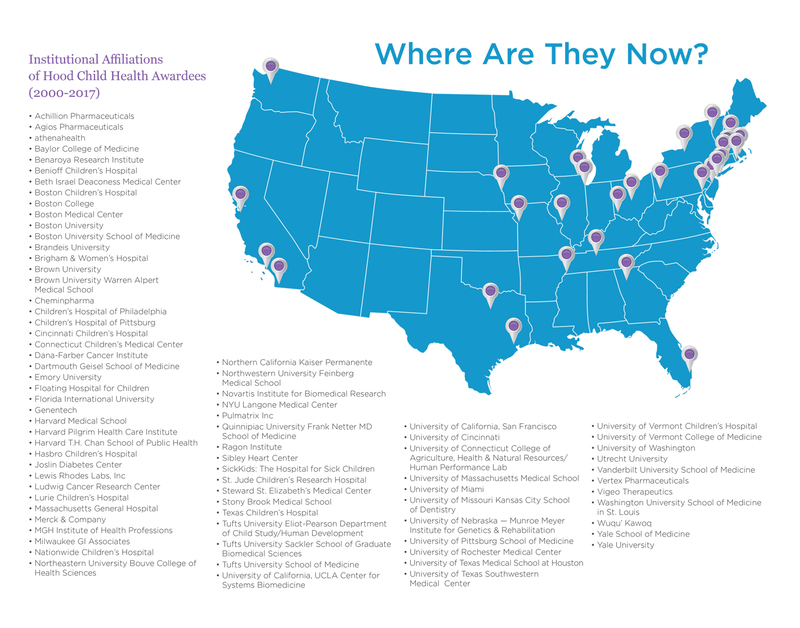 Institutional Affiliations of Hood Child Health Awardees are located nationwide. Click to see who our awardees are. Findings suggest that the award achieved one of the major goals for which it was intended: to launch the careers of junior pediatric research faculty by providing leverage to attract funds from other major sponsors. More than 88% of award recipients were able to pursue research ideas that might be considered too risky or that could not have otherwise been explored. Many recipients valued the boost of self-confidence and institutional respect that the Hood Award bestowed upon them. 54% of the 1991–2000 award recipients secured at least one NIH R01 grant, far exceeding the national average of approximately 30%. 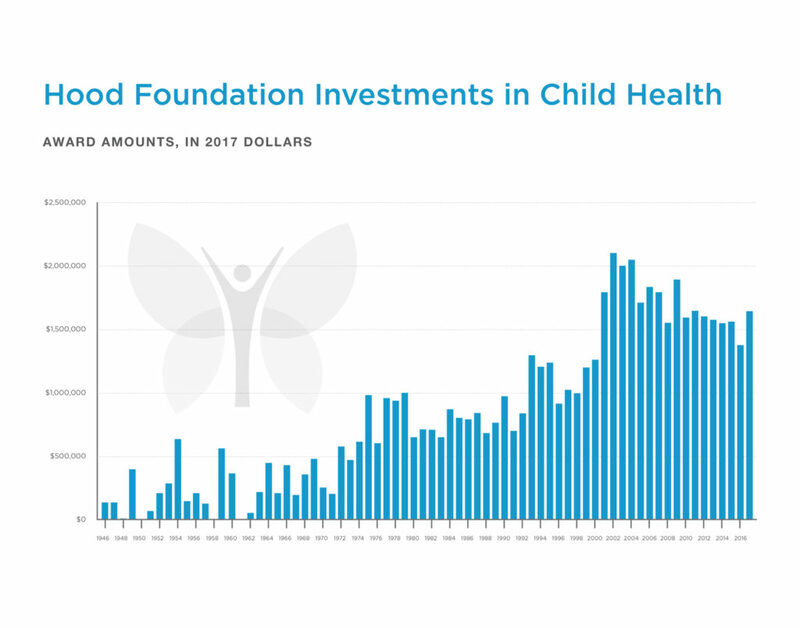 $796 million in total funding from the NIH following the 1991–2001 Child Health Awards, more than 100 times the initial Hood Foundation investment of $6.8 million. 1996–2000 award recipients were significantly more likely to secure R01 funding compared to unfunded applicants (49% vs. 32%). 1996–2000 award recipients received almost twice the total dollar amount of NIH funding compared to unfunded applicants ($206 million vs. $106 million). Dr. Evan Snyder, 1994 Hood Award Recipient – Evan Snyder, M.D., Ph.D., is Professor and Director of the Stem Cells and Regeneration Program at The Burnham Institute in La Jolla, California, and Director of the Southern California Stem Cell Consortium. 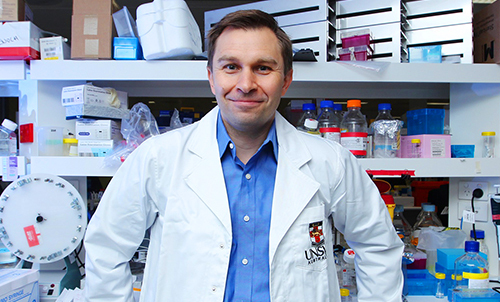 After 23 years at Harvard, he was recruited to the Burnham Institute where he continues to be regarded as a leader in regenerative medicine and stem cell biology and works as a pediatrician with a specialty in neonatology, or intensive care for newborns. His research has produced over 120 peer-reviewed scientific publications and has been funded by numerous grants and awards, including support from the NIH, the California Breast Cancer Research Program, the March of Dimes, and Project ALS. Research from his laboratory may also lead to effective stem cell–based therapies for children with brain developmental disorders and some forms of mental disability. "The Hood Foundation grant provided me a wonderful opportunity to expand research in the area of rehabilitation robotics to children with cerebral palsy – and allowed me to publish the first peer reviewed journal article in this area of study (American Journal of Physical Medicine & Rehabilitation). It also provided me with the opportunity to independently manage my own grant, and allowed me to learn important administrative skills in the process." "It allowed me to collect preliminary data needed for NIH grant applications. Given the current situation of NIH funding, large amounts of data are necessary in order to be competitive in R01 grant applications. So the Hood Foundation Award is tremendously helpful for providing initial funding for junior faculty." "The funding allowed me to hire a research assistant which was invaluable to my research progress and my success in securing a K08 grant which has since led to an R01. Thanks very much!" "This Award helped most in that it allowed me to hire an additional postdoctoral fellow as I was starting my laboratory. It boosted the productivity of the lab at a time when generally a laboratory is ramping up and less productive. In this way, I feel that I got a head start and was able to demonstrate considerable productivity as I applied for governmental funding." "It provided the early funding that a new faculty person needs – particularly for hiring post-docs and technicians to help ease the burden of labor-intensive projects. Not only did it help me to obtain data for federal grants but, with being able to hire other people in the lab to do the labor, it gave me time to actually write the grants and analyze the data." "Provided protected time for me at a critically important time in my research career. It helped me to launch an independent research program, providing time to write an R01 application (that was ultimately funded)." "It boosted my confidence that the area of my research was important to child health and that its implications would be beneficial to children and other individuals affected by the diseases under study." "Allowed me the resources – materials and a postdoc – to take risks and get enough preliminary data to get my first R01. Now have five federally funded grants, might not have been possible without the Hood grant in the critical beginning time period."